As marijuana recreational and medicinal use becomes legalized in many states in the U.S., more Americans are using the drug than ever before. This sudden shift in approach to weed has been polarizing, with the population tending to divide itself into two camps: those who believe the effects marijuana has on the body to be purely beneficial and those who believe them to be strictly harmful. However, the reality is more nuanced, with how marijuana affects the body being both good and bad depending on what systems you are looking at, the age of the user, how the drug is consumed, and the reason for use. Can you overdose on marijuana? No, but other risks are present. To better understand this, let’s look at how marijuana affects your body system by system. 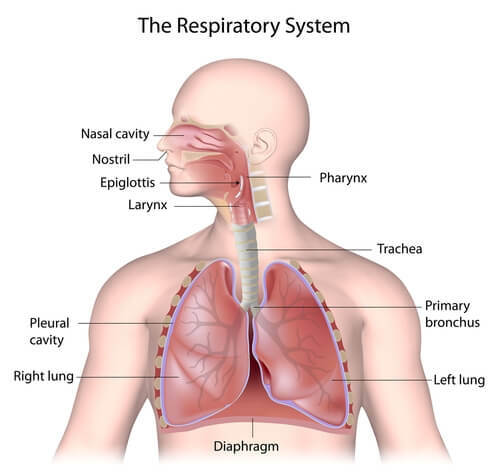 What Does Weed Do to the Respiratory System? What is the Impact of Pot on the Circulatory System? How Does Cannabis Affect the Central Nervous System? What is the Marijuana Impact on the Digestive System? What Does Weed Do to the Immune System? What is the Pot Impact on the Endocrine System? How Does Cannabis Affect the Skeletal System? When talking about what are the effects of marijuana on the body, the focus tends to go immediately to the brain. However, if the method of ingesting the substance is smoking, the first system to experience effects is the respiratory system. It is a common misconception that marijuana smoke is less dangerous than tobacco smoke. In truth, marijuana smoke contains many chemicals and carcinogens that are similar to those delivered by tobacco smoke. This means the side effects of marijuana on the body can be similar to those of tobacco. Does marijuana cause cancer of the lungs? At this point, it is not clear. There are some studies that show a link between smoking cannabis and the development of lung cancer, but these studies have been called into question because individuals who smoke weed often engage in other habits already proven to cause lung cancer, such as smoking tobacco products. What is clear is that smoking weed can cause increased cough, sputum production, hyperinflation, and upper lobe emphysematous changes. However, not all effects on the body’s respiratory system are bad. In the 1800s, marijuana was used in acute doses to treat asthma due to it causing bronchodilation. And when ingested through methods other than smoking, it does not appear to have any negative impact on the body’s respiratory health. One of the more interesting interactions between marijuana and the body is how it impacts the circulatory—or cardiovascular—system. Because the circulatory system is responsible for getting the drug to the central nervous system, produce the high the drug is known for, it comes into direct contact with the drug soon after consumption, especially when smoked or vaped. In new or casual users, cannabis can increase heart rate and supine blood pressure and even cause marked orthostatic hypotension. Logically, one might assume that these effects become worse with frequent and prolonged use, but the opposite is true: the more someone uses the drug, the closer to normal their body’s cardiovascular system becomes, even moving in the opposite direction (i.e., lowering supine blood pressure). However, for those predisposed to heart disease and other heart conditions, there is no safe level of marijuana use as it has been linked to myocardial infarction in those with poor cardiovascular health. Even those who are healthy should take caution, putting off things such as strenuous exercise until the drug is gone from the body (see: how long does it take for weed to get out of your system). When exploring how does marijuana affect the body, the central nervous system is key. It is here that the effects users seek are produced—from the high sought by recreational users to the pain relief many medicinal users want. It is also where many negative effects of use can take place. The greatest central nervous system risks of cannabis use are in young people, particularly with heavy or long-term use. This is because marijuana consumption is linked to altered brain development in users whose bodies not yet finished growing, reducing IQ, impairing cognitive functions, and even placing the user at greater risk of developing mental illness. Does weed kill brain cells in underage users? At the moment, the exact manner in which marijuana causes these changes is not known as studies on adolescent patients are limited. Where more data is available is on how the drug impacts the body’s central nervous system in adults. For example, THC—a compound in marijuana that produces a high—has been shown to alter the function of the hippocampus and orbitofrontal cortex. This then results in impaired thinking, limits the ability to learn new facts and processes, and reduces the ability to perform complex tasks. The same compound affects the cerebellum and basal ganglia, which control balance, posture, coordination, and reflexes. There is also a belief amongst researchers that it could cause increased mental illness, though this has yet to be proven. 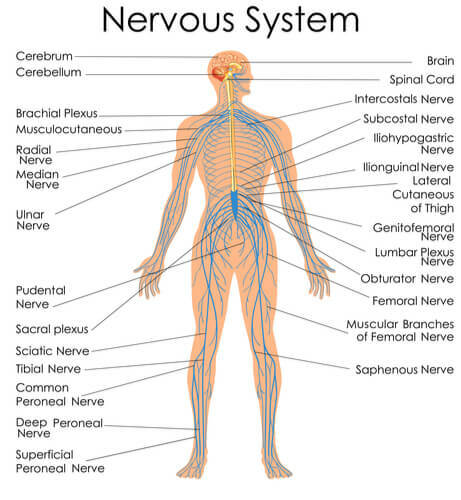 Central nervous system impacts of cannabis are not all negative. In fact, most medicinal uses of cannabis are related to the positive effects it can have on the body’s central nervous system of certain users, especially purple marijuana. For example, cannabinoid compounds can interact with nerve receptors to slow down pain impulses, reduce feelings of nausea, and increase hunger. Anyone considering using the drug for therapeutic purposes should speak with an experienced doctor in order to properly weigh the pros and cons, including the potential for cannabis withdrawal. When marijuana is consumed via marijuana bowls, joints, or bongs, the impact on the body’s digestive tract is lesser than when it is consumed via drinks, edibles, pills, and tinctures. THC, in particular, interacts with gastrointestinal tract cannabinoid receptors. For those with certain diseases, this interaction is a positive one; cannabis has been found to have therapeutic use in treating inflammatory bowel disease, irritable bowel syndrome, and motility-related disorders. This is because activating cannabinoid receptors can relax the lower esophageal sphincter, inhibit acid secretion and motility, and stimulate the intestinal primary sensory neurons. However, when consumed by someone not suffering from gastrointestinal disorders, marijuana can lead to problems. For example, its ability to reduce diarrhea from intestinal diseases can cause constipation in the bodies of healthy persons. As such, whether these effects are positive or negative depends on the individual. 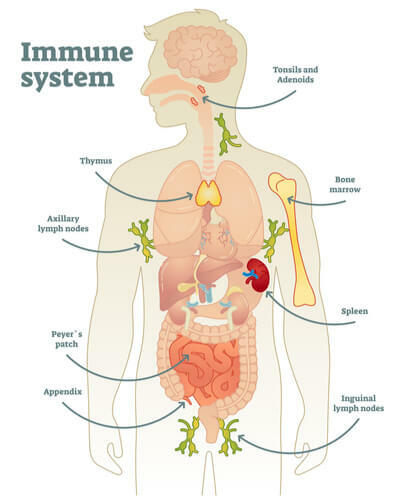 There is significant concern regarding the interplay between marijuana and the immune system. Because the immune system is essentially the guardian of the body, any positive or negative impact or marijuana on it will have far-reaching consequences. However, studies on the effects of weed on the immune system are limited. The majority of studies have been conducted on patients with HIV or Hepatitis C with focus on specific elements of the immune system—for example, the T cells. The results of these studies have been positive, helping improve the immune response in the bodies of individuals studied, but they do not provide an accurate picture of the impact on immunity in healthy individuals, or even individuals with non-autoimmune diseases. One concern is that cannabis can over-activate certain elements of the immune system, leading to the development of autoimmune disorders. Others theorize that marijuana has the opposite effect in those without autoimmune diseases, weakening their body’s immune response rather than strengthening it. However, these are just ideas at this stage and have yet to be researched properly, giving us a limited understanding of marijuana before and after impacts on the immune system. Research on marijuana interactions with the endocrine system has been primarily limited to fertility. Marijuana’s effects on the body’s reproductive system have been studied heavily in animal test subjects, but sparingly in humans. However, the results of the studies have been almost universally negative. Heavy and long-term use in men has been found to reduce plasma testosterone levels, retard sperm maturation, and increase the production of abnormal sperm—which could, in turn, lead to congenital disabilities and miscarriages. Females have shown similar effects. Cannabis consumption has been found to interfere with the hypothalamic-pituitary-gonadal axis and to delay ovulation through reduced hormone secretion. While there are some studies of women who have undergone tubal ligation that show neutral effects, no study has shown a positive impact of marijuana on the body’s reproductive system. How marijuana affects your health is so far-reaching, it even has an impact on the bones. However, this is the one body system where the impacts of marijuana have been found to be universally positive—at least for now. What does weed do to you in terms of your bones? The CB1 receptor is found in skeletal nerve terminals while CB2 expresses in osteoblasts and osteoclasts, stimulating bone formation and inhibiting reabsorption. However, the studies on this are limited, and new studies may reveal more negative effects on the bones than positive ones. What does smoking pot do to your body? Ultimately, there are many variables at play and more research needed to come to an accurate conclusion. This means that choosing to use cannabis carries a lot of known and unknown risks, including marijuana dependence. Certain populations should avoid consumption completely due to proven and significant risks; cannabis should not be consumed by those underage nor is smoking marijuana while pregnant advisable. For individuals already using marijuana and concerned about the potential negative health impacts on their body, treatment for substance addicts can help. There are rehabilitation centers available across the United States offering data-backed approaches to getting clean. Both outpatient and inpatient rehabilitation institutions can be used. Ultimately, there are ways to end use and avoid relapse weed addiction. If you or a loved one wish to seek help with marijuana dependency, contact our addiction specialists at (888)-459-5511.